Ever since meeting with the fetal cardiologist I've stayed away from researching HLHS, which is what Kaleb will have if his left side of his heart does not continue to grow. I've done a great job of this until now, at some point I needed information on it. Why are all of Kaleb's conditions so rare? When I heard he had a heart defect I almost felt hopeful because even though clearly the heart is one of the most important organs in the body, children are born with heart defects often and current medical science is so amazing in what they can do these days. I feel like I'm constantly pushing against something and there's no give, I'm getting tired. Like I said before, I just want someone to say to me, "Oh I see this a lot, we can fix it". Hypoplastic left heart syndrome occurs when parts of the left side of the heart (mitral valve, left ventricle aortic valve, and aorta) do not develop completely. The condition is congenital (present at birth). Once the diagnosis of hypoplastic left heart is made, the baby will be admitted to the neonatal intensive care unit. A breathing machine (ventilator) may be needed to help the baby breathe. A medicine called prostaglandin E1 is used to maintain circulation of blood to the body. The first surgery, called the Norwood operation, occurs within the first few days of life. Stage I of the Norwood procedure consists of building a new aorta, and an artificial shunt is inserted to maintain blood flow to the lungs. Afterwards, the baby usually goes home. The child will need to take one or more daily medicines and be closely followed by a pediatric cardiologist, who will determine when the second stage of surgery should be done. Stage II of the operation is called the Glenn shunt or Hemifontan procedure. This procedure connects half of the veins carrying blue blood from the body (the superior vena cava) directly to blood vessels to the lungs to get oxygen. The surgery is usually done when the child is 4 - 6 months of age. During stage I and II, the child may still appear somewhat blue (cyanotic). Stage III, the final step, is called the Fontan procedure. The remainder of the veins carrying blue blood from the body (the inferior vena cava) is connected directly to the blood vessels to the lungs, and the right ventricle now serves as the only pumping chamber for the heart. This surgery is usually performed between the ages of 18 months and 3 years of age. After this final step, the baby is no longer blue (cyanotic). In some hospitals, heart transplantation is considered a better choice than the 3-step surgery process. However, there are few donated hearts available for small infants. The problem develops before birth when there is not enough growth of the left ventricle and other structures (aortic and mitral valves that guard the exit and entrance of the ventricle and the aorta, the blood vessel that carries oxygenated blood from the left ventricle to the entire body). In patients with this condition, the left side of the heart is unable to send enough blood to the body. As a result, the right side of the heart must maintain the circulation for both the lungs and the body. This extra workload eventually causes the heart to fail. The only possibility of survival is a connection between the right and the left side of the heart its blood vessels, through which blood may pass. This is called a shunt. Babies are normally born with two of these connections (the foramen ovale and the ductus arteriosus), which normally close on their own a few days after birth. If ductus arteriosus is allowed to close in a baby with hypoplastic left heart syndrome, however, the patient will quickly die because no blood will be pumped to the body. As with most congenital heart defects, there is no known cause. Around 10% of patients with hypoplastic left heart syndrome will have other birth defects. A physical exam may show signs of heart failure, liver enlargement, rapid breathing, and lethargy. Additionally, the pulse at various locations (wrist, groin, and others) is usually very weak. There are usually abnormal heart sounds when listening to the chest. We had our fetal cardiologist appointment yesterday with Dr. Fleishman of the Congenital Heart Institute. They did a sonogram of Kaleb and an echo-cardiogram. Yet another doctor who isn't very positive. I just want to hear ONE specialist say, "I see this all the time, don't worry". That's all I want, just a few words. The doctor feels as though Kaleb's left side of his heart is at the very low level of a normal size and says because of that the left side of his heart may stop growing all together. If this happens Kaleb will have to have a series of three open heart surgeries, two before he is 6 months old. Each surgery will be a one month long hospital stay. The plan is to go back to get an echo-cardiogram every 4 weeks to measure his heart and make sure that it is growing. If not then we will need to prepare for a very tough battle, worse than any of his other special needs. The doctor wasn't very positive about the surgery either, a fetal cardiologist! He talked about how terrible and hard on a baby the surgeries will be. He also told me that I'm at an increased risk for spontaneous abortion (my body causing me to go into labor and Kaleb not surviving) until I have him. No one has ever said those words to me but I kind of figured with all of the issues Kaleb may not even make it to be born. It's just different I guess when a specialist tells you that. This practice of doctors is part of Arnold Palmer Hospital (the current hospital we go to) and Miami Children's. This means that if there is a child they decide to do surgery on then all of the doctors from BOTH hospitals sit and have a meeting about the best possible solution for that specific baby, so instead of only having my fetal cardiologist with his eyes on my "case" I will have NUMEROUS, that is about the only comfort I got today. I continue praying that Kaleb's heart does keep growing and does not fall below "normal". From what I can gather, the left side of our heart is the most important because it pumps to our entire body. Also with the surgeries the oldest patient they have surviving is 20 years old so no one can say the life expectancy of someone with that condition and those surgeries. It was nice seeing Kaleb again. His feet are definitely "rocker bottom" feet and it almost looks as if they are not "opposite clubbed feet" anymore. It could have been the angle though. We also saw one of his hands partially open, the other one was still closed. But it looks as though they aren't fused together at least. The one open hand has some bent fingers from what we can tell but I can live with that. He was moving like crazy again and it was hard to do the echo-cardiogram with all of the movement. It makes me proud that he moves so much. If you think about it he is reacting to a uncomfortable situation and that shows to me he is already smart and having "thoughts". This morning I woke up and just cried in bed. I am in a daily state of shock and numbness. Every morning I can't believe this is happening and then I think of a new situation we will have to go through. Such as..."Kaleb is going to have to live at home his entire life", "How is this going to affect Nolan", "I don't want Nolan to get upset with us because his life is also going to be changed forever"..etc. I'm so lucky to have Dennis with me at all times. I've been trying to email other mother's with a similar chromosome disorder and have not heard back from one of them. I desperately need to find someone that has been through this same type of disorder and I can't find anyone to talk to. There are people who have children with rare chromosome disorders but for now I need to speak to someone whose child has had nearly the same disorder. The mommies on my birth board on BBC are amazing women, I just wanted to point that out and copy some of their amazing responses (more so I can remember this moment in time). They help motivate me to stay strong and keep people updated. I am so heartbroken along with you. It has been such an emotional rollar coaster for you and your husband, and to be given a diagnosis that is so rare and to not know what to expect... I can imagine that it feels like your world has stopped spinning, but everyone else just moves along in spite of your pain. I will continue to read and walk along side you on your journey with Kaleb, as you discover more about who he is and who you are as his mommy. Things will never be the same again, and I am praying for you. I feel like we went through so much around the same time, and my heart aches for you. I can't give you any guarantees that he will be okay or what to expect, but I do give you my prayers and presence, please continue to keep us updated. Erin, I know you probably don't feel like it, but you area STRONG woman! I am sure the road ahead will be far from easy, but I am also sure it will be very rewarding. That little boy is lucky to have a mommy like you, willing to go the distance!!! 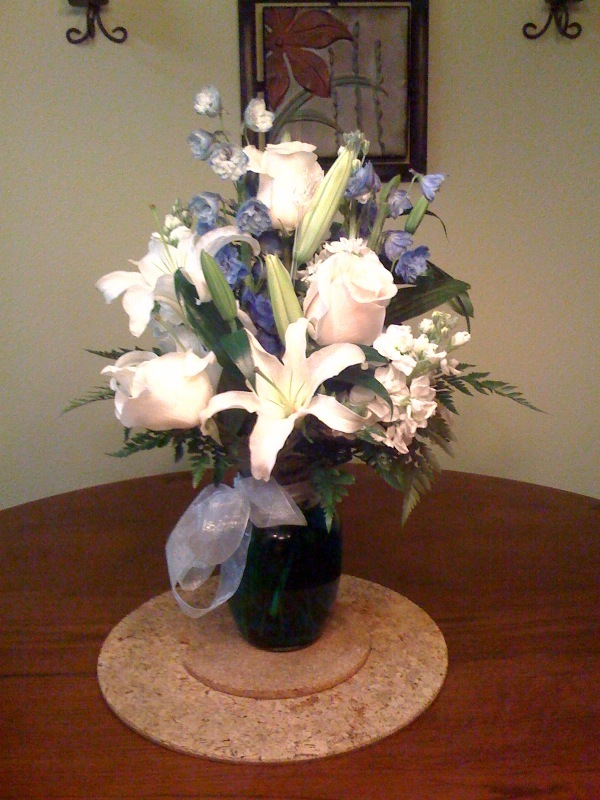 Also, my dear friend Kelly Hunter sent us these beautiful flowers today, I told Kaleb all about them and made sure he knew that she made them especially "boyish" just for him. We are so blessed. We love you Kelly! One out of a million...literally. As most of you know last week at our 20 weeks ultrasound we were told that our baby has some birth defects with his hands and feet. We saw a specialist the next day and he also found a heart defect. He suspected Trisomy 18 (fatal) so I got an amnio. My FISH results came back negative for Trisomy 13, 18, and 21 (downs). We have been so excited and living our lives "normally". We knew the rest of the amnio results were EXTREMELY rare disorders and the odds were in our favor. Yesterday while at work the Women's and children's hospital in my city called with the results of my full amnio, there's a problem. A very rare problem, SO rare there are MAYBE 50 people in the WORLD with this disease/disorder. My son has a partial trisomy 9p (and 3/4's q). I don't expect anyone to know what that means but here's some explaining. Instead of having an entire extra third 9 chromosome, he has a full part of the 9p (p is the stop of the chromosome) and has half of the 9q portion (q is the bottom of the chromosome). Most studies are either on children having partial 9p or partial 9q. My hospital is famous around the world for working with the most sick children and being at the forefront of research and studies. Yet there were were in the waiting room waiting for our meeting with the genetics counselor and here I see the counselors at the printer copying pages out of a research book trying to learn about it before our meeting. Because no one has really ever dealt with this disorder the outcome is truly unknown. A child with only a partial trisomy of the top of the 9 chromosone looks to have pretty good chances of life (with moderate to severe mental retardation). However, a child with the same 9p and a little bit of the 9q (bottom half) is a worse diagnosis. This small 9q part that he has looks to be causing his heart defect as well which may be life threatening. Our son has a good chance of living (I think) however his quality of life is going to be poor (possibly). We go in today to meet with the fetal cardiologist for a fetal echo cardiogram to get answers on his heart defect and if it is fixable. We also need to tour the NICU and meet with the Orthopedist at some point. My baby now has a cardiologist and a genetics pediatrician. They told me yesterday that I have a "choice" to terminate the pregnancy. I don't really feel like I have a choice. This has nothing to do with pro life or pro choice or anything like that. I can't imagine ending my baby's life and living with that for the rest of my life. I just can't do it. If my son is going to pass away it needs to be on his own terms and until then I need to make his life as comfortable as possible. My son has a name, he moves, he is a human being and there is a chance he will live a very long life and that is not something I am going to mess with. I found a story about a boy who was born with the EXACT same chromosome disorder that my son will have. However, since each chromosome holds so many different genes for every person then their outcomes could be different, but this gives us hope. He is now almost a teenager and has lived a fairly "normal" life. He wasn't born with a heart defect but I'm keeping hope that is something that can be fixed. He also had the same feet condition that my son has, it's basically the opposite of clubbed feet and I've been trying to explain this to people and was getting so frustrated that people didn't know what I was talking about and just kept telling me how fixable clubbed feet are, even though they aren't clubbed feet! This website of this boy explained that they are just opposite clubbed feet, not not clubbed, but it made me feel better that someone understood me. Even if this family is in England. There is a support group for children that have some form of this disorder in England, they only have 19 members and again it is not exactly for what my son has. I cannot believe that out of all of the odds in the world this is happening to US. They don't really know the odds but something like 1 out of 50,000 (at least). We were told this may be in our genes but somehow we came out okay so we got our blood drawn to get a picture of our chromosomes. If either of us is positive for it then we need to get my 1 year old screened (in case his is not manifesting in something physical we can see but maybe mental or cognitive) and then we will know that future pregnancies could risk having this disorder. I am so numb. At times I feel happy that he has a pretty good life expectancy for all of the problems he will have (we won't know for sure until we have the echo today though) but then a portion of me feels guilty if I have him and he is bedridden or cant talk or can't see or something else. It's too much to think of. I'm a wreck but I'm trying to stay positive, it's hard. Here is a link to wikipedia that has a page on the closest thing to my son's condition. This website talks mostly about a full trisomy (an entire extra number 9 chromosome) but our son does not have that so the fatality of the disorder is not the same. There is also a picture on the website that I have copied below. If you see there are bands that are numbered. The picture is of the 9 chromosome that we all have 2 of, normal. My son has an extra one of those from the top of the picture to the number 9q21 band (shown on the picture). Everything below the 21q is not there. Thank to all of you who have kept us in your prayers and thoughts. "Baby gulps down several ounces of amniotic fluid every day, both for hydration and nutrition and to practice swallowing and digesting. And, these days, those taste buds actually work! Studies show that after birth, babies are most interested in tastes they've already experienced through amniotic fluid. Meaning, think about what you want your future child to eat as you prepare your own lunch." 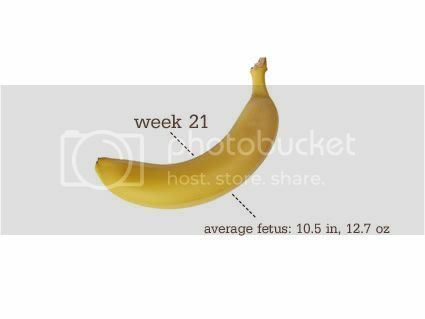 Baby’s Size: A banana. 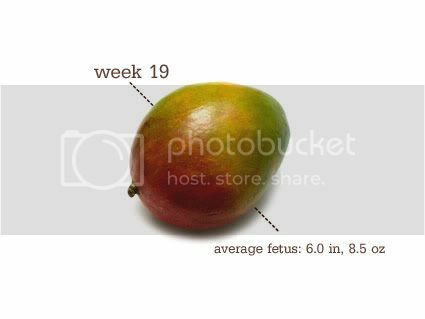 This is the first week that baby is measured from head to foot, not head to rump. He/she is now 10.5" long and over half a pound!-- Actually at my perinatologist office the baby looked to be 13oz at that point, and that was a week ago. Already gonna be a chunker! Total Weight Gain: I think at most a few pounds, it's weird! Maternity Clothes: ugh...I pretty much HAVE to wear them now but normally about two days a week I will still try to get away with my normal work pants but it's really starting to hurt the tummy. Gender: BOY! My son is not shy and will show any technician, doctor, or specialist his goods. Movement: the baby hasn't been moving like crazy like Nolan did but as long as he is moving I'm okay with that for now. He really hates when I'm sitting down and bend some at my waste (like to get closer to the computer screen or closer to someone I'm talking to) and he will kick me continually until I move from that position. Sleep: on the decline. I toss and turn throughout the night because my stomach can just not get comfortable and of course when I wake up on my back I freak out and have to quickly turn over. I now have to sleep with a pillow between my legs, under my belly, and in between my hands. Symptoms: Not much, I get hungry like crazy but not much else...my back has been hurting some but that's fine. Best Moments this week: Getting the definite negative results of any trisomy and learning that the baby's odds of trisomy 18 is 1:100,000 (yay!!). my spina bifida test was also negative. Now I just have to wait for the rest of the amnio results! What I miss: what i miss? I never get this question. What do i miss about not being pregnant or what do I miss about life...what's going on with this question? i miss uninterupted sleep. not to mention the sleep loss from the baby but Nolan is starting to wake up in the middle of the night, he apparently does everything backwards. What I am Looking forward to: going back to see the specialist in two weeks and my OB (who called me Monday and called me hunny and told me I was in his prayers and he thinks about me often)...anyways I'm excited for some more answers with another sono, even though that holds the possibility of more bad news. Milestones: Finally past the worry over Trisomy 13 and Trisomy 18, goodbye! I don't know what else to do. I go from the computer to the bed and then back to the computer again. I'm tired of waiting. I want to call the hospital and yell at the genetic counselor who is supposed to call with the results, "WHERE ARE MY RESULTS". I would hope that with news like this she would call as soon as the results were in her hands, but I don't have much faith in people lately. When I make my way to the computer I'm surrounded by some great women on my "birth board" who seem to be going through this with me and I update them regularly. It feels nice to not feel alone right now. I think Dennis wants to be left alone more than I do so I let him sleep and watch re-runs of House Hunters and Designed to Sell because I think that makes him feel a little better. This is a very awkward place to be. Is there a handbook of what to do in this situation? I have laundry and dishes to do but it just doesn't seem right to do anything but sleep or blog. I remember yesterday when we got home from the hospital, Dennis took the dogs out and I stood against the kitchen counter (eating kit-kats). When Dennis came back inside I asked him in a very honest way, "What do you do when you find out your baby may die?" There's no directions on what to do and I very seriously didn't know what I was supposed to do in that moment. The only thing we can think of is sleep or lay in bed. I need to start a caringbridge.com website for little nemo but I don't want to yet because I don't know what we are looking at. It's 12:43 pm and still nothing. This is the worst waiting ever. My phone rang twice today and I almost had a panic attack each time. The second time I got so pissed that the dumbass people on the other line were even calling me repeatedly I threw my phone into the car cup holder and had a hissy fit. I keep checking my phone to make sure it's working and my heart rate is through the roof. Anything I think about the phone call I start feeling a panic attack, this isn't good. Dennis is still in bed. I can't lay down anymore or I just stare into space and get really upset. It helps to write or talk to people. It's so hard to get happy about anything right now. Nolan has his school party today (we took donuts, his first time eating one too...lets hope it goes well!) and although I can go I probably won't. It's hard to even smile, even if it's fake. People at his school ask me how I am and all I can say is "fine" with a fake tone. I can't lie to people. I'm not fine. But just about the only thing that makes me happy right now is picking my son up from school and seeing him playing with his friends and learning new things and hearing about what he did that day. So I will continue to pick him up even if I have to fake my happiness. There's a continuation of bombs that won't stop exploding. Just when I think I am grasping the fate of this little one and can do something about it another one goes off that is worse than the last bomb. I can't describe how this feels, almost like a sick joke. I don't want to eat. I don't want to sleep. I don't want to do anything but just stare into space. I don't feel alive anymore, something terrible has been taken away from me. I can't write about it and I hate to think about it. If I could have hid my phone today I would have. I didn't want to talk to anyone and I couldn't even cry. The news is so unbelievable I can't even cry. After meeting with the perinatologist at the hospital I sat outside on a bench waiting for Dennis to pull the car up (I had an amniocentesis and needed to rest as much as I could) and it felt like the world was going on without me in it. I saw mommies around me with babies in strollers and pregnant women smiling to have just found out what they were having, I saw valet workers laughing about their friends and cars whizzing by...I wasn't there in that moment. I was somewhere else...I had been paused and the world continued. What a weird feeling. Tomorrow will be another struggle and maybe soon I will be able to write about the horrible things that are happening right now. For now it almost feels like therapy to just write how I feel, I need to journal because I will always want this to look back on. One moment my life was just fine and then in another moment it was like a bomb went off. Dennis and I went for our 20 week anatomy ultrasound on 8/16. We found it was a boy and things went just fine. The technician said something about who reads the scans and she is only a technician and not a doctor and if my doctor needs to call me he will. We worried for a mere second about why she would say that and then went back to celebrating another boy and showing his picture to everyone. My life was as it always had been for the next 23 hours. The next morning I got a phone call from a number I didn't have programmed in my phone at 7:15 am. I screen all of my calls so I didn't answer, and I was still in bed trying to sleep. Something clicked though when a voice mail was left, what if it was the doctor? I listened to the message, "Erin, Dr. Peppy here. Call me back as soon as you get this message". My life...our lives...were forever changed by that one simple voice mail (which still sits in my voice mail box). I called Dr. Peppy back who is actually normally very peppy, but not for this call. He told me there was something wrong with the baby's extremities. He said he doesn't know what it all means but the baby may possibly have clubbed feet but also has abnormalities in his arms as well. I sobbed. I didn't ask questions. I just sobbed. I did however mange to write key words down that I heard during the phone call, because I knew that was one important call. He told me to come to his office for a blood work form to get done immediately and he would refer me to a specialist. Dennis and I went to his office to pick up the paperwork, Dr. Peppy happened to walk by and waved happily as he does to all of his patients. Then he realized who he was waving at and that clearly the woman he was waving at, at the front desk desperately needed help and guidance...I had no make up on and my eyes were severely swollen with my face entirely red. I tried to keep my sunglasses on as long as possible when I entered the doctors office, until it just felt un-cool and "jersey shore" like of me to do so any longer. Anyways, Dr. Peppy grabbed me by my hand and held it on the way into his office. He showed us with his hands/arms what our baby looks like and again said he doesn't know what is going on and that's why we need the specialist. He kept saying how important it was to rush and we need to hurry because I have "decisions" to make. He didn't need to tell me what decisions I needed to make, it was pretty clear. Dr. Peppy hugged me, as he always does when he sees patients and we left. I went to Quest to get my blood drawn and while there the lab lady who took my info asked me if I was going to be okay (I'm telling you, I looked HORRIBLE). We got to talking and she told me about her amnio experience. She also then bumped me to the front of the line and I was in and out in 10 minutes. Amazing. Dennis and I decided to go out to Tampa to spend the day with my mom with Nolan. It helped get my mind off of things and kept me away from the vast knowledge of Google. I didn't hear from the specialist all day. Wednesday: Finally the specialist called me this morning and set the appointment for tomorrow morning. They explained I would see a perinatologist (OB specialist) who would give me another sono, read the results, and if they recommend an amnio at that point I can have one right away. This is all so scary and obviously I don't want a huge needle going through my stomach to my uterus but I'll do anything for this little man. We need answers and I'm so excited to be moving forward and finally feeling like I can do something here. "Have you ever thrown a fistful of glitter in the air? Have you ever looked fear in the face and said I just don't care? It's only half past the point of no return, the tip of the iceburg, the sun before the burn, the thunder before the lightning, the breath before the phrase, have you ever felt this way?" With 20 weeks comes a very heavy heart. I don't know what the future has in store for us or Nemo but for now I have to have hope. "Baby gulps down several ounces of amniotic fluid every day, both for nutrition and to practice swallowing and digesting. And, these days, those taste buds actually work! Studies show that after birth, babies respond best to tastes they've already had via amniotic fluid. Meaning, think about what you'd like your future child to eat as you prepare your own lunch." 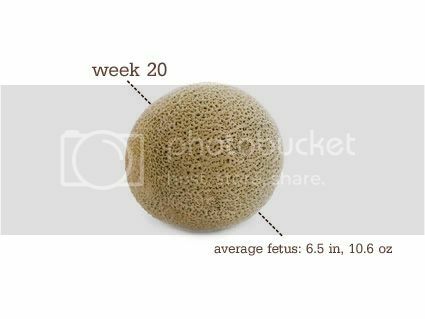 Baby’s Size: A cantalope- 10 1/2 ounces and 6 1/2 inches. Total Weight Gain: If any...only a few pounds. Gender: We're having a boy. Movement: His little kicks have a whole new meaning now. Things are most certainly changed. I'm happy to feel the kicks, reminds me he is in there and moving all around. Sleep: Has been fine. Last night was the first night of sleep since finding out the results of our ultrasound and I slept alright, when I woke up I was sure it was all a nightmare. When I realized it wasn't I just sobbed in bed. What I miss: the "before"
What I am Looking forward to: Hearing from the specialist, completing all the tests so we can get some answers. Milestones: I'm halfway through the pregnancy. The baby will come before my due date so maybe even a little less than halfway left. "Vernix caseosa, a greasy white substance made of lanugo, oil and dead skin cells (yum) now coats baby's skin, shielding it from the amniotic fluid. (Picture yourself after a nine-month bath, and the need for protection makes sense.) You might actually get to see the vernix at birth, especially if baby is premature." Total Weight Gain: 0lbs, I'm amazing!!! Maternity Clothes: I wear maternity shirts most days but can get away with my non maternity pants on some days, although on the days I do wear them they cut into my stomach area so I should probably stop wearing them but I really don't like maternity work pants. Gender: No clue. I'll find out in exactly 5 days! We all think it's a boy, but I'm still holding out for a possible girl. But really...EVERYTHING points to boy. Movement: Not just feeling the baby at night anymore, it's a great reminder that little nemo is in there. Especially with house crazy my life gets with a one year old to chase after. Sleep: I can't get enough. I'm still exhausted like women are in the first trimester. I can barely keep my eyes open now. Blah... But when I do go to sleep I stay asleep until about 4-5am and then my bladder is so full I'm in pain but so tired I REFUSE to get out of bed. I know, that's bad. No need to lecture...I'm not going to change it. Symptoms: Well I officially haven't thrown up in a little over a WEEK. Holy cow! I haven't even really been nauseous, It's a miracle! I haven't had EXTREME hunger either. Everyone now and then I will crave one certain food but my main obsession is still popsicles, my weakness. Sometimes I will skip dinner just to have SEVERAL popsicles. Best Moments this week: The fact that I haven't thrown up all week!! And all the fun movements, feels like muscles twitching. What I miss: my work pants fitting without hurting my belly. What I am Looking forward to: LEVEL II SONO in FIVE DAYS!!!! Jessica, if you read this start preparing your resignation letter. I'll miss you at work but you'll be GREAT at home with the kids. Thanks! I felt you move for the first time tonight (7/29/10). It was amazing and I had forgotten what that "butterfly" type feeling even felt like. It's amazing how much you forget in such a short time period. You're movement made me feel so much better because as I was laying in bed I was thinking about my other baby turning the big ONE the next morning and feeling so many emotions from that. I realized that I will soon have two babies and no matter how old the both of you are at any time of your lives, I will probably always call you both my babies. Now of course I can mainly feel you moving at night since I'm laying still. Things are hectic right now and sometimes I honestly forget I'm even pregnant but I love spending the nights with you and feeling your little limbs poke me. That's our special time :) I love you nemo and can't wait to meet you!